Are you in your 40s and feeling more inclined to follow your heart? I am. 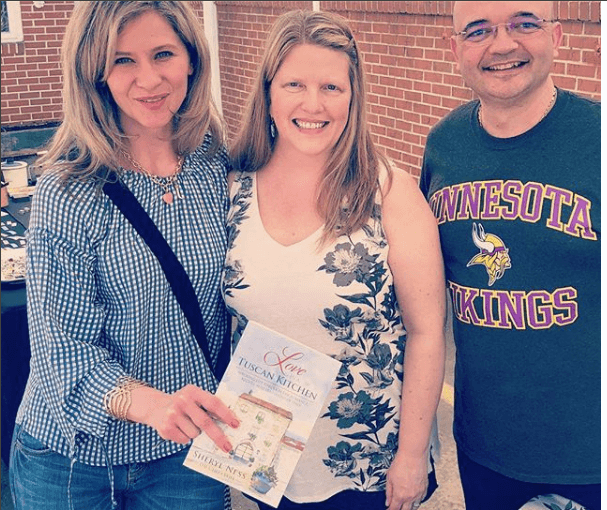 While at a wine tasting and outdoor local market hosted by Tessa’s Office and Dwell Local, I met author Sheryl Ness and her husband Vincenzo. They were serving up samples of Sheryl’s Lavender Ginger Biscotti, one of 38 recipes featured in her book, Love in a Tuscan Kitchen: Savoring Life through the Romance, Recipes, and Traditions of Italy at their booth. Yum! I tried to talk them into convincing me that biscotti is a health food. I bought the book. Sheryl signed her name and “Follow your heart,” in it in red ink. Her journey is inspiring. It’s such fun accompanying her to Italy through it. I was reading it as she was spending time in Italy with Vincenzo and posting beautiful pictures on her Instagram account. It enhanced the romance and wonder of her story even more for me and made me hungry for delicious, traditional Italian food. I’ve read it and put it on my Summer Reading List for 40-Somethings. Q: You met your husband at a restaurant. I met my fiancé at a restaurant (a much less nice one). So many people go out to eat on first dates and blind dates. What do you think it is about restaurants and romance? A: Restaurants are a bit of an indulgence, something special at least for me. Growing up in a farm family, we did not go out much. I think this adds a bit of excitement to the idea of eating out. This also gives you an opportunity to be fully present in the moment of eating and enjoying the food in front of you…with no stress of preparation and doing the dishes later. I also love trying new dishes and exploring tastes that I have not tried before. In Italy, I loved eating at Vincenzo’s restaurant at that time because I could actually see and taste the love and care he put into creating each dish that was presented in front of me. I could tell it was prepared with love and passion. I was very curious about the person who was behind the beautiful and simple foods I had eaten for weeks. The chocolate cake was simple, but absolutely divine. I knew I at least had to have the recipe so that I could recreate that feeling when I got back home to Minnesota. It was a complete surprise to meet Vincenzo and feel the reaction he had when he met me as well. The sparks were there immediately! As I mention in the book, the moment I looked into his beautiful brown eyes, I felt like I could see my future reflected back at me! Q: You were 42 when you went to live in Italy for the 2nd time full-time and set about rediscovering you – the real you. What do you think it is about the 40s that sets many women on a journey to discover, or rediscover themselves? A: I’m not exactly sure, but for me I felt like I finally realized that if I wanted to be happy and content in my life, it was my responsibility, not someone else’s. Perhaps I had never really given myself the power to do this. I knew what I did not want (in a relationship for sure) and what I did want. I kept focusing on the things that I needed in my life and tried to put the negative feelings behind me. Q: During this time, what were you most surprised to discover about yourself? A:During my time in Italy, I had the chance to be “just me” with nothing defining me that had been there in the past. Not even my career, which had been one of the most important things. I discovered things that I had loved at one time, like cooking, but I never had time for in my busy life. I also discovered the power of being present in the moment with gratitude for the newness and beauty around me. Being in a new place, with a language that was also new to me allowed me to see things with my eyes wide open. This is when I started to keep a journal, which I had never really done before. The journal is what I drew from to eventually write the book. Writing was also a new discovery for me. I realized how much I enjoyed expressing myself in this way. As an introvert, this was a fantastic outlet for me. I was writing part-time for Mayo Clinic (the Living with Cancer blog and Newsletter) at the time and so this idea of writing for a living was also a new discovery for me professionally. Q: What do you think prevents women from discovering their own real selves? A: For me, it was my own self-confidence and perhaps my personality (shy introvert). I was always being defined by the man in my life …more than what I wanted deep in my heart. This is something that many women probably do. In doing this, I realized that I had missed out on opportunities and ideas that I would have loved to experience. When I finally discovered that I could do and be what I wanted in my heart, it was a big discovery. I became very focused and determined because I felt I had wasted time in my life waiting for someone else to make me happy. Q: When it comes to revealing yourself, sharing yourself, and being vulnerable – what were the most challenging hurdles you faced while in Italy? After all, it can be hard enough to do that in a place one has lived for forever. A: The most challenging thing for me was the language. I felt like the culture was perfect for me, but I struggled to express myself so many times. However, I found this allowed me to be present in a different way, by observing and listening, more than just talking and having conversation. I observed body language and got very in touch with my empathetic self. The ability to sense someone’s feelings without words. It was incredible. Q: Apart from it being what you grew up with, what about living a farm to fork lifestyle resonates with you? A:I love meeting the farmers and producers of the food I eat. I enjoy talking with them and seeing the care they take in creating something that nourishes others. You can usually see and hear the pride in their words. I remember my parents around the farm table, eating fresh produce from the garden and items that my mom would can or preserve. Also, the traditions of growing sweet corn and sharing it with others – as well as freezing it for our long winters. This is why I appreciate people who are food artisans today. Like Amy and Linda from Gardenaire and others who are at the local farmer’s market each week. When I travel, I always look for small, local markets that carry locally produced items to see what is available in the area. What makes cooking for others so satisfying to you? A: I always think of the word nourish when I think about cooking for others. It’s not just about making and eating good food, it’s about caring for others in a way that is very personal. It’s about cherishing someone by providing food to keep them strong and healthy. Cooking for others is also a way that we celebrate with each other. Most of our traditions, such as holidays, weddings, baptisms, birthdays, etc. include being with others and enjoying food. This tradition seems even stronger in Italy. Sometimes to the point of overabundance (such as in Vincenzo’s mother!). However, it is always a show of love and care, even when in excess! Love in a Tuscan Kitchen nourishes the soul with its words and its recipes. What books have you read lately that you’ve found nourishing? I’d love to know! Please send your recommendations to melissa@40fitnstylish.com.